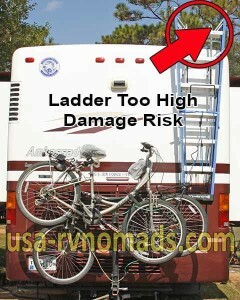 It’s a common thing to see an RV step ladder attached to the rear of a motorhome. Most prefer to hang their RV step ladder on the rig’s ladder. I know some of you newbies are asking why do I need an extra ladder if there is one already on my rig? Well, once you start to perform the required maintenance you’ll quickly find out. 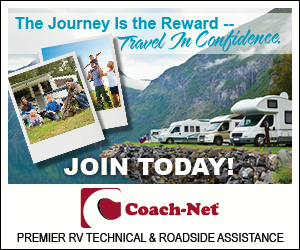 Although the rig’s permanent ladder allows you easy enough access to your roof, it still isn’t so easy to reach the upper sides or the top of your windshield while laying in a prone position on the roof, your head and shoulders hanging over the edge. A good, appropriate height step ladder helps solve that issue. 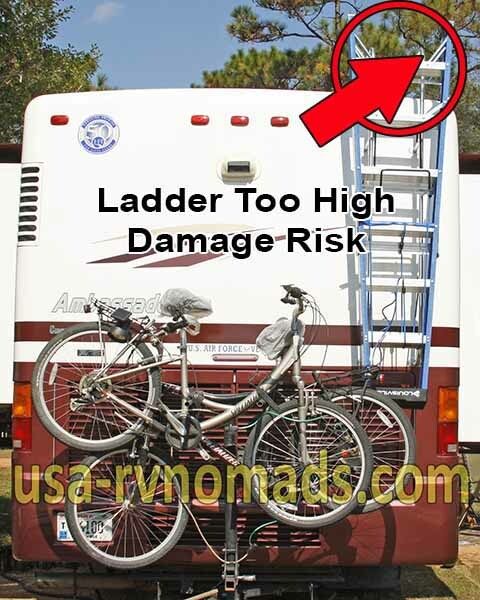 How you hang your RV step ladder is important. There is a RIGHT and WRONG way to do it. Many do it WRONG! In these images I will illustrate what many are not understanding when they hang their ladder on the back of their rigs. 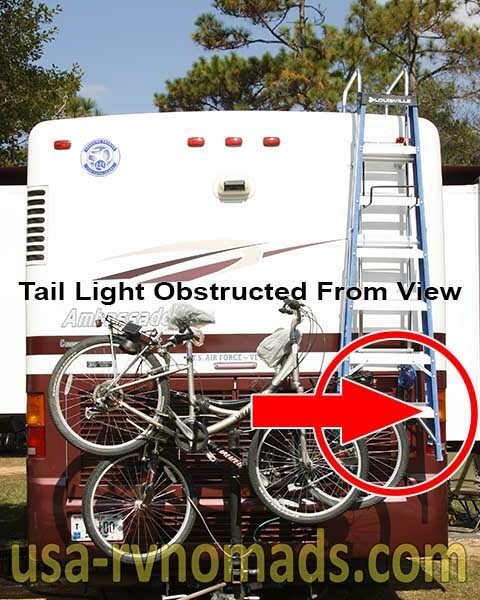 Make sure your ladder doesn’t block your tail lights. When you hang your step ladder legs pointing down, the leg end of the ladder is wider than the top, depending on your rig may be blocking your tail lights. It’s not a good idea to do that. One, it’s illegal to obstruct them, and secondly…if someone is day dreaming behind you and you have to make a rapid stop…you want all the illumination all of your brake lights can provide. 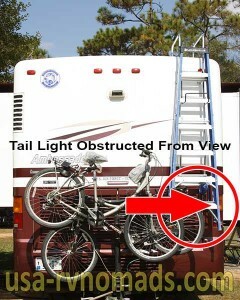 By hanging the ladder upside down, narrow end to the bottom, it’s less likely you’ll be obstructing your tail lights. Again, give anyone following you ample warning that you are stopping or about to make a turn. Another consideration you need to heed is not placing your ladder too high up. Your vehicles maximum height was determined by the manufacturer of the highest point, based on the equipment mounted on the roof. Generally, the top of your ladder is about equal in height above the roof as the air conditioners and such. When you mount your ladder above those items, your overall height changes and the risk of snagging the ladder on something increases. 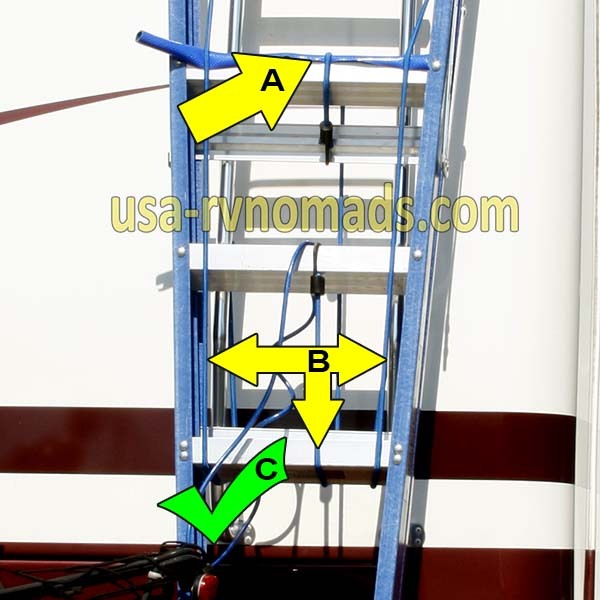 It’s not a good idea to have your step ladder hook onto something and rip the permanent ladder off the roof and back of your RV. It’s a mistake that will cost you plenty to repair. Secure your step ladder to the rig. How? 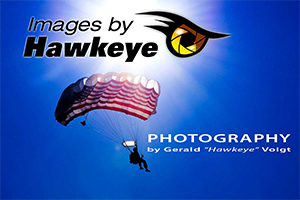 Typically one would use bungee cords, and if you do make sure you are not using the cheapest ones you can buy. A step ladder can be a costly item to replace, but that cost increases even more when you end up losing it on the highway and it takes out someone else’s vehicle in the process. A: Protect the cords from abrasion on sharp edges by using a section of garden or water hose slit down the length of the hose. This will allow the hose to slip over the edge of…in this case, one of the cross braces on the ladder. If you don’t have a piece of hose, use some cardboard wrapped and taped into place to keep it from moving or falling off. In a real pinch, you can on a temporary basis, wrap a cloth rag around the cord where it makes contact with the sharp surface. B: Use more than ONE cord to hold the ladder in place! 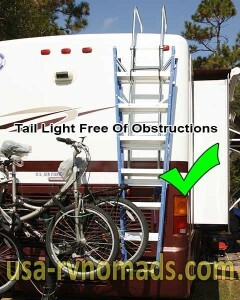 I’m using three here and the ladder doesn’t budge one inch while traveling. If one fails there are two more as backup. I check the ladder and the bicycles at every stop. C: Lock it up too! 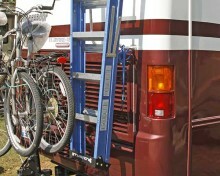 Get a bike lock or other suitable means to lock the step ladder to the permanent ladder on the rig. To make it a bit more of a challenge, I also wrap the cable around the rear wheel and luggage rack on one of the bikes we tote. Remember too that when using your step ladder make sure you fully spread the legs apart, set it up on solid level ground and don’t stand on the very tip top of the ladder…in other words read and follow the ladder manufacturer’s safety instructions so you don’t find yourself laid up and not able to enjoy the RVing Lifestyle!